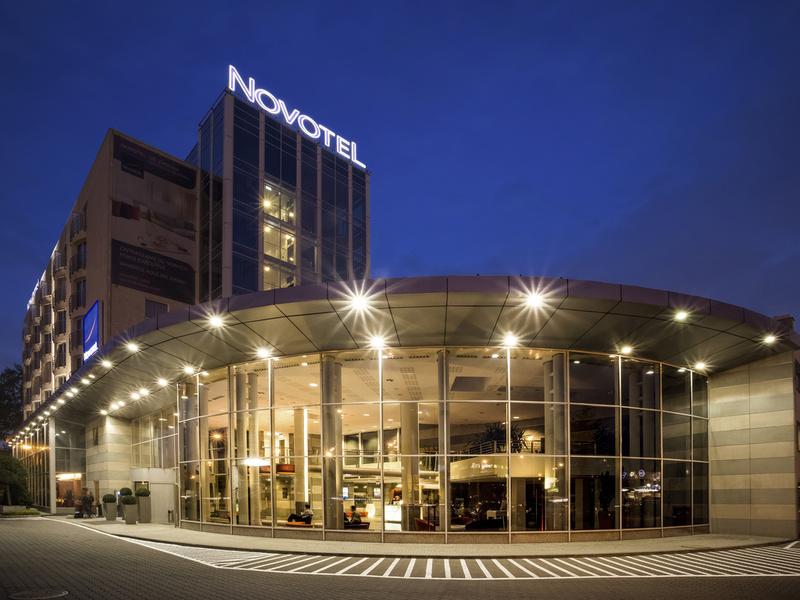 Stay at the 4-star Novotel Warsaw Airport Hotel and enjoy the convenient transport links. The hotel is close to the city center and offers a free shuttle bus to Chopin airport. Relax with your family in the Novo Square Lounge Bar with its exquisite intern ational cuisine. Unwind in the garden with its outdoor pool and keep fit at our fitness club. Our discreet, professional staff will help you organize your conference, gala or exhibition at Novotel for up to 730 people while you relax and enjoy the event! Spacious, contemporary in design, and adaptable, the Novotel room is truly a place for living. Perfect for all your needs. Our Executive room offers you additional products and services: Nespresso coffee machine, iPod docking station, additional toiletries, bathrobe and slippers, free Wi-Fi, local phone calls and water, 4pm check-out. Maximum 2 adults and 2 children. Discover the place where life tastes better. Extremely clean, new, modern facilities. Everything you need in the room like electric kettle, fridge, instant coffees and teas. Staff was very helpful. Food in the restaurant was good too. Easy shuttle to and from the airport. This was the nicest hotel that we stayed in Poland and also the cheapest. Highly recommended. Excellent rooms, superb price, nice room service. All was great except shower are where shower does not drain water fast enough when its on full capacity and so it leaks to the floor because there is almost no barrier. I lstayed in a superior room. Everything was comfortable, big bed, big tv, shower/bathroom, iron board in the room. Good location, all clean and super friendly staff, including the General Manager. Christophe is really engaged and provides the best possible customer experience. The hotel is convenient for working, getting to the airport and working 10 minutes away at a client. It was my 4th or 5th visit. I keep coming back. The restaurant food is good too ... very convenient too. We have booked two rooms in the hotel. Because of the delay we had called to the hotel that we will arrive around 10PM whether the reservation can be hold for us. The answer was Yes without any problem. Once we came to the hotel reservation was canceled and we had to sleep with my coleague in one room because everything else was full. ... and the winner is: Novotel Warszawa Airport! In Warszawa we have already visited Ibis Stare Miasto, Sofitel, Mercure Centrum, Novotel Centrum but only in Novotel Warszawa Airport accepted after dinner (delicious BTW) our polite request for custom dessert &quot;Hot raspberries with vanilla ice cream&quot; (custom = the item is not in the menu). Good team, Christophe! I stay here always when I come to Warsaw. The hotel is 15min taxi to downtown. The staff is excellent. Some remembered me from last time. There is music on Thursday. The staff make you feel at home here. The building is always being upgraded. Also the rooms. Galleria mokotov is ten minute taxi from hotel for shopping. Staff at the hotel were really nice, welcoming and helpful. I could do early check in and late check out. Food was good, room as well. The gym was well equiped. Not too far from airport and still close to the city center. Nothing to discuss. No attention to Platinum status member. Poor communication. Absolutely amazing hotel, service and staff. Delighted. Another excellent stay at Novotel Warsawa Airport! Our 6th visit here and it never let's us down. The staff, both reception, breakfast and room, all super friendly. No complaints with breakfast or room standard and cleanliness. We shall be back again very soon. Very professional check-in staff, very modern and clean room, the minibar well stocked, very comfortable bed and a fantastic breakfast in the following morning.